Ukraine has said several ports in the Sea of Azov have been “partially unblocked” following a military standoff last week that led to 24 Ukrainian sailors detained by the Russian navy. Ukraine’s infrastructure minister Volodymyr Omelyan confirmed the minor easing of tension on Tuesday. “Yes, Berdyansk and Mariupol ports are partially unlocked. 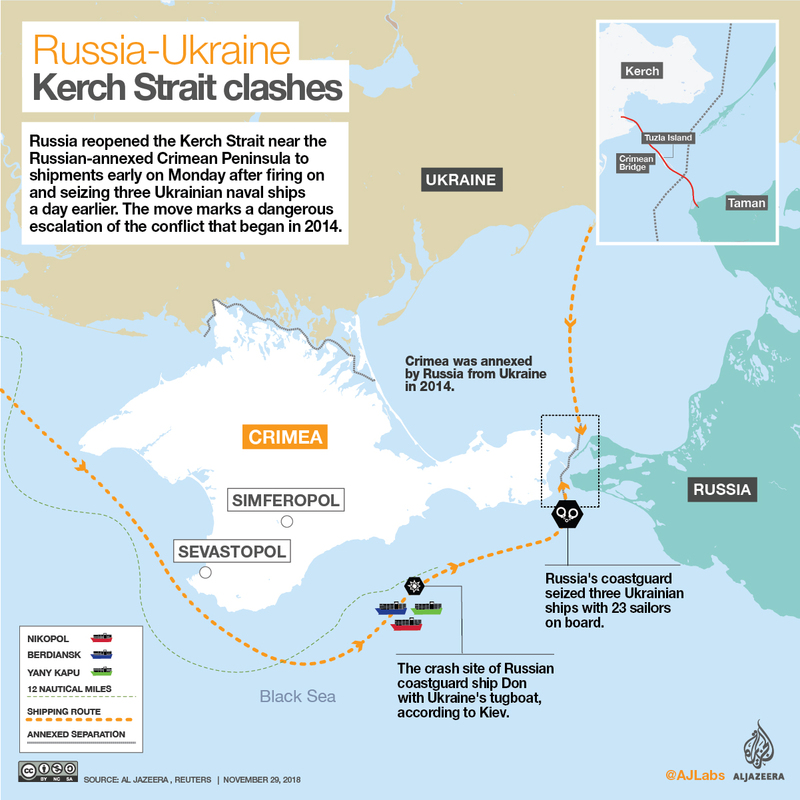 Vessels make their way to the entrance and exit through the Kerch strait toward Ukrainian ports … the movement is partially restored,” Reuters news agency quoted the minister. Last week, Russia blocked the Kerch Strait, which connects the Black Sea to the Sea of Azov, effectively putting the ports of Berdyanks and Mariupol under blockade. According to Al Jazeera correspondent Andrew Simmons, Tuesday’s move does not mean the situation is solved. “One has to be somewhat cautious because under the treaties that allow Russia and Ukraine to share the Azov Sea, the countries can inspect each other’s ships,” Simmons said from Kiev. “Russia is using that by spending a lot of time checking these ships,” he added. As a result of the crisis, about 300 Ukrainian dockworkers were fired, Simmons said. Russia had seized three Ukrainian ships that were travelling from the Black Sea to the Sea of Azov through the Kerch Strait and captured the Ukrainian crew members who were later put under 60-day pre-trial detention and sent to Moscow. The deadlock led to a rise in tensions between the two countries, which have been at odds since Moscow-backed president, Viktor Yanukovich, was removed from power. Russia annexed the Crimean peninsula in 2014 following Yanukovich’s ouster. The Ukrainian government imposed a 30-day period of martial law – the first ever martial law in the country’s history – in 10 of Ukraine’s 27 regions after the stand off. The measure, which affects the regions closest to Russia’s military bases, was condemned by the Kremlin, which said the move would escalate the conflict. Ukraine also urged NATO to deploy warships in the face of what it called Russian aggression. On Tuesday, NATO leaders will convene in Brussel to discuss the situation, among other things. But according to Simmons, the international community, especially NATO, is not doing enough to solve the crisis. “Brussels is discussing this in great detail, but as far as Ukraine is concerned not enough is being done,” Simmons said.